Our 2019 Performance Line Up Is Here! In addition to our main parking lot at 1220 Diffley Road, performance parking is available at the Lexington-Diffley Athletic fields (unless noted). Banners and signs will be posted. Walking distance to amphitheater is a hilly 5-minute hike from either entrance. Golf carts are available to transport guests with mobility needs. The Summer Performance Series provides the community with access to music, theater and dance performances by artists of diverse ethnic and artistic backgrounds. 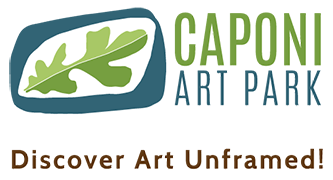 For 2019 CAP is switching roles from presenter to co-creator and working with the artists, an intercultural consultant and community members to create immersive experiences for the audience that go beyond a single art form or culture. Held on Sunday, June 9, 6:30 p.m. – 8:00 p.m.
Join us at Caponi Art Park for a collaborative performance by Nirmala Rajasekar and Zeitgeist, SUMMER RAIN features five works that blend Indian Classical music (Carnatic tradition) and Western classical new music. Each piece focuses on a different facet of musical traits, similarities and differences between the two musical cultures. This interactive event welcomes people of all ages and backgrounds to listen and learn. Grab a blanket or some chairs, your family and friends and join us under the leafy canopy! Held on Sunday, July 14, 6:30 p.m. – 8:00 p.m.
Back in Africa Siama Matuzungid became a soukous legend, recording his intricate guitar on hundreds of songs and touring the world with popular artists. Now in Minneapolis, his catchy, upbeat songs and musicianship have earned him a McKnight Fellowship and numerous grants and a Parents’ Choice Parent Approved award. He loves performing and sharing his music with people of all ages. This interactive event welcomes people of all ages and backgrounds to listen and learn. Grab a blanket or some chairs, your family and friends and join us under the leafy canopy! Held on Sunday, August 18, 6:30 p.m. – 8:00 p.m. Artist members of Electric Machete Studios will create a site-specific immersive experience featuring contemporary and experimental work rooted in traditional Latinx and Indigenous art methods. Drawing elements from their community art happenings (improvised performance events), art exhibits, and intergenerational workshops there will be music, visual art, hands-on activities, food, and movement.